Last May, GET-UP filed for union recognition with the National Labor Relations Board. In response, the Penn Board of Trustees hauled graduate students into hearings, argued that grads cannot be both workers and students, and ultimately delayed our election by 203 days. In December, we were excited to finally receive our election order and to continue organizing graduate student workers to have a democratic say in their workplaces. Unfortunately, Penn’s opposition has continued with arguments along the same old lines. In the past weeks, we’ve seen numerous anti-union e-mails riddled with falsehoods and scare tactics formulated to intimidate grads. Instead of recognizing the majority of grad student support we demonstrated back in May, Penn chose to invest tuition dollars on frivolous legal hurdles orchestrated by the union-busting law firm Ballard Spahr. Their strategy is to delay, stall and confuse, all at the expense of grads exercising their legal right to organize. And most importantly, in contradiction to labor law, Penn has continued to forcefully assert that graduate students are mentees and future colleagues – but not workers. Why can Penn take such a hard anti-union line against the rights of its grads? Because Penn is relying on the Trump-appointed National Labor Relations Board as a backstop. It has only taken the Trump NLRB a few months to overturn numerous protections for workers that were established in the last eight years. We believe that the Trump NLRB, when filled with a majority of union-busting appointees, will also move to overturn the Columbia decision that recognized our right to organize around our wages, working conditions, and benefits. In response to these challenges, GET-UP took an important and powerful step to withdraw our election petition in order to ensure that Penn and the NLRB cannot use our campaign to overturn the Columbia precedent. We made this decision in a Special General Body Members’ Meeting on Thursday, February 15. Our petition to withdraw was submitted to the NLRB today and we are waiting for an official acceptance notice. While we are disappointed in Penn’s administration and by the appointments of union-busting NLRB members, we know that a union is ultimately much more than an election. 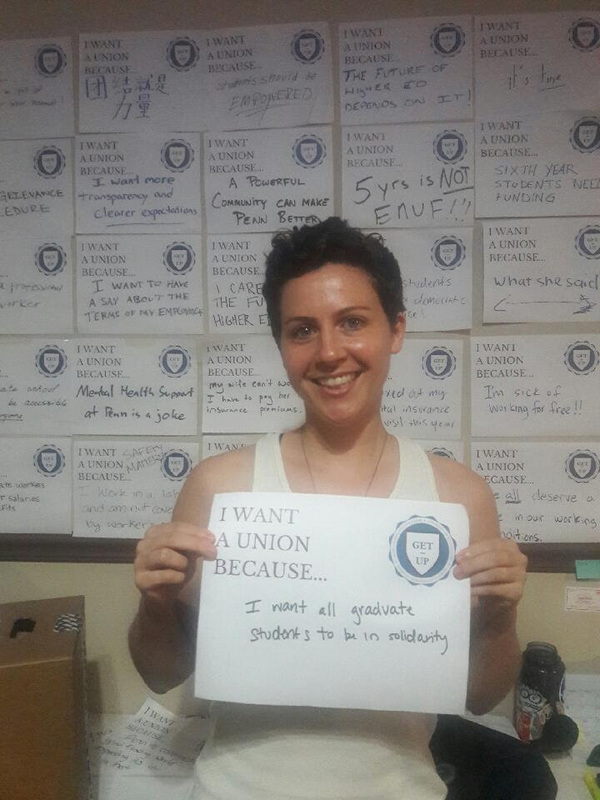 Withdrawing our petition helps protect grad workers’ rights across the country and our ability to organize for an election in the future. To that end, GET-UP, in partnership with the American Federation of Teachers, will continue to organize graduate students, to advocate for graduate worker rights at Penn, and to press for union recognition directly with our administration. Over the coming weeks, GET-UP will be developing a long-term strategy for our campaign, and we encourage all members to be a part of this process in their departments and schools. Our colleagues in the the Graduate School of Education will be presenting a petition at the University Open Council Forum on February 21 from 4:40pm-6:00pm in Bodek Lounge, Houston Hall. For the past several months, GSE has been organizing to improve the reporting mechanisms for and graduate worker protections against sexual harassment in their school. GET-UP will be a strong presence at this meeting. Please consider joining us (and wear your shirt or pin!). 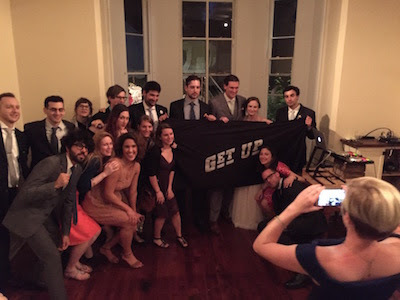 GET-UP is the union of graduate student workers at the University of Pennsylvania. Our aim is to improve our working conditions, enrich our academic experience, and transform the university into a more democratic workplace for the benefit of the wider community. We remain committed to working together for a better Penn. GET-UP aims to support and bolster the important work of IDEAL’s members and partner organizations as they call for clear grievance procedures and a centralized Diversity and Inclusion office. In our capacity as a union, we will help put pressure on Penn’s administration through contract negotiations and public presence alike. We will work together to combat the tremendous power imbalances that exist between Wax and the Penn administration on one side, and graduate and undergraduate students on the other. To do so, GET-UP will advocate for a fair, transparent, universal and anonymous grievance procedure in our contract negotiations with the university and for significant changes to Penn’s approach to marginalized communities of students and student workers. GET-UP will continue to stand with marginalized members of our community. We also encourage our members and supporters to sign as individuals in solidarity with the IDEAL Council’s letter here. 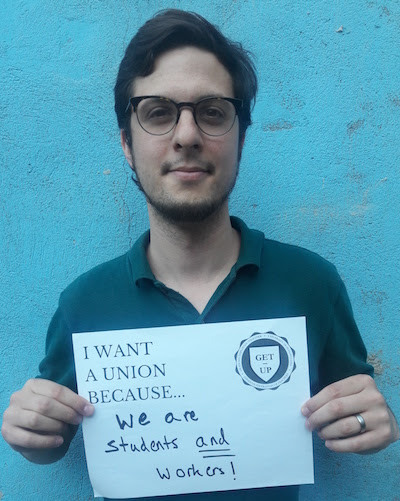 GET-UP has been organizing for over a year to win formal recognition of our union and a contract with the university—and we encourage you to sign our public pledge to vote YES in a union election. An essential part of GET-UP’s mission is about building a community, one that can defend our members when our values are under attack. Last week, GET-UP published a response to Penn Law Professor Amy Wax’s hateful op-ed about the supremacy of 1950s “bourgeois culture.” Today, we stand together to condemn the white supremacist rally and terrorist attacks in Charlottesville. As far right organizations are targeting university campuses as staging grounds for their racist culture wars, GET-UP is committed to building a university community where people from all nationalities, racial identities, and religions can thrive. GET-UP stands together with many across our campus, joining our voice with theirs to condemn racism, sexism, homophobia, Islamophobia, anti-Semitism, and oppression in all its forms. We continue to call on Amy Gutmann to condemn racism on campus, without equivocation. GET-UP will always stand with marginalized members of our community. We hope you will too. Sign our public pledge to vote YES here. NLRB Hearing Update: Finally, the last day! After 12 grueling days of hearings, the lawyers finally acknowledged that the hearings would come to a close. MHO (Madame Hearing Officer) and the lawyers noted that there wasn’t a large audience today, laughing with what seemed to be relief that the hearings were drawing to a close. Mr. Johns, Penn’s leading lawyer, finally acknowledged that not all of his team was from Ballard Spahr, and one of the men there today was actually part of Penn’s general counsel. 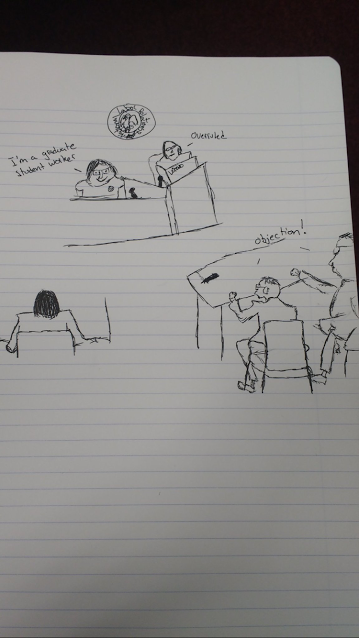 There were no witnesses brought to the stand today, just brief discussions about NRLB policy around summer elections, and of course their continuous and asinine assertion that we are “students” not “employees”. As Mr. Johns stated towards the end, “This is the realm of academics, not employment”. Maybe this split is why graduate students are constantly put in exploitative, vulnerable, and boundaryless positions in relationship to faculty. Maybe it’s why we have some of the worst mental health statistics of workers in our age bracket. Later, when reading NLRB policy, Penn lawyers argued that we don’t qualify for a mail-in ballot election even if we were to be considered employees because we are not “scattered or diffuse” but rather all centralized on campus and in West Philly — yet then only a few minutes later, the summer election was considered to be anti-democratic because it would disenfranchise those who aren’t on campus! These two things cannot be true at once! But we know that calling our election anti-democratic is just another stall tactic–using the rhetoric of democracy to prevent workplace democracy is really poor form, if you ask me. Penn’s lawyers then tried to undermine our strategy for determining eligibility. We want as many students within the unit as possible to be eligible to vote; Penn’s administration wants the opposite. Their lawyers tried to argue once people finish teaching/researching, they don’t usually go back to it, which factors into voter eligibility. One of my good friends taught for a semester after she returned from fieldwork, and I’m sure we all know someone in that position–these are the people Penn’s administration is trying to disenfranchise, because they have some fantasy that everyone’s teaching and research schedule looks exactly the same. The administration’s lawyers seem keen to ignore the facts. It is so clear that over the past two and a half weeks this administration has made a mockery of our essential contributions to the university and in doing so has continued to indulge these ridiculous arguments to guarantee that our work and presence stay unrecognized. Penn admin and our lawyers now have 14 days to prepare their briefings for the NLRB (there was some hinting that admin lawyers would ask for more time because of the July 4th weekend…stall, stall, stall). Congrats to everyone in GET-UP for making it through the hearings!! We now just wait to hear back from the NLRB, and get all hands on deck to respond to their decision about the election. 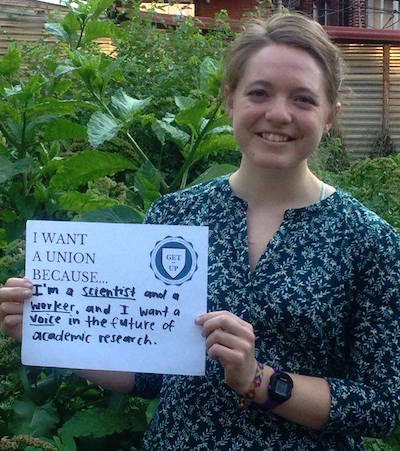 I proudly stand in public solidarity with all of my fellow graduate students to say that our work and contributions matter, as does our health, safety, and legal protection. 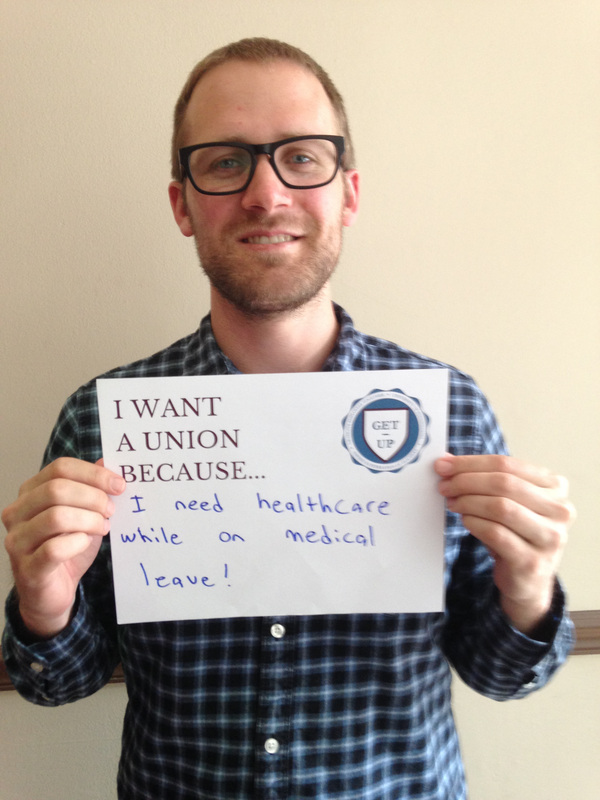 You, too, can stand with GET-UP by signing the public pledge to vote yes for a union! Jennifer and Kenny of SEAS here with your update from DAY TWELVE of the hearings. We’ve been following along virtually for the past few weeks, and today was our first time attending. Since we’ve never been to one of these before, we were interested to see what they were about, and wanted to come support GET-UP grad witnesses. Three grad student workers testified over the course of the day: Rosie Clark (Annenberg), Allison Russell (Social Policy and Practice), and Ozan Kiratli (SAS/Biology). GET-UP’s lawyers went first, and established Rosie, Allison, and Ozan’s entire work histories. Penn’s lawyers then repeated the same questions — at least twice. They also went over in detail these grads’ teaching, research, and CV’s. (Actually, they declined to question Ozan about his CV, perhaps because all of his teaching is listed as “work experience.”) As always, Penn’s lawyers were trying to prove that our work is not work. The overall feeling we got from the administration’s lawyers was extreme condescension. We felt like they were devaluing the witnesses, and by extension, all of us, as workers and even as adults. The administration’s lawyers implied over and over again that our work is not real — but everyone’s testimony made clear that when we leave Penn, we leave behind a treasure trove of research and knowledge (or in Ozan’s case, a library of flies) for future researchers. We know that the university doesn’t work without our work, and the witnesses today proved that yet again. We were also struck today by the disparity in working conditions and compensation levels between programs. We had no idea that grads in SP2 don’t receive summer funding. Learning about other grads’ experiences is one of the most empowering things that has come out of GET-UP. We stand in solidarity with the grad witnesses who testified today from Annenberg, SP2, and Biology, along with all grads at Penn. Because we know that when their conditions improve – when their voices are amplified – we are all stronger and more secure. 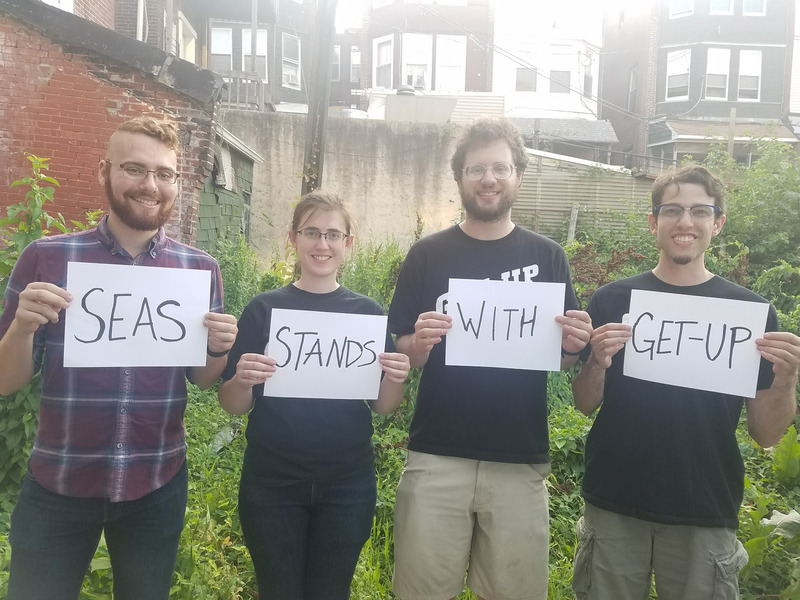 We in SEAS stand with GET-UP. And we thank Rosie, Allison, and Ozan for their courage and honesty today. If you haven’t done so yet, show us you stand with GET-UP too by signing the public pledge to vote yes for a union! P.S. Kenny got on the admin’s lawyers’ nerves with his loud typing whilst live-tweeting. He regrets nothing. Today was the 11th day of our NLRB hearings where Penn is trying everything it can to delay our election long enough to give Donald Trump a chance to take away our right to unionize. However, it was only the second day of testimony from graduate student workers. Up today were grad witnesses Jackie Bannon from Nursing, Kelly Karch from BGS, and Miranda Weinberg from GSE and Anthropology. There were many highlights from today, including my colleague Kelly’s testimony. She is a fellow Biochemistry and Molecular Biophysics (BMB) student. I heard from Kelly about her experience testifying. She described her work as a research assistant and TA, which for her included developing exams, leading recitation sections, and even lecturing on topics where she was more knowledgeable than the professor teaching the class. Not only did Penn’s lawyers claim that none of these roles count as work, they also suggested that Kelly was dishonest about her motivation for TAing on departmental forms she has filled out. They attacked her integrity as she testified under oath. It was very frustrating for me to hear about how Penn lawyers repeatedly asked leading questions to attempt to put words in her mouth rather than accept her honest testimony about her experiences. Later, Miranda Weinberg testified that she works for 20 hours a week as an RA in GSE, and she was the instructor of record in a GSE class during her 5th year. Penn’s lawyers (seven of them present in the hearing room at one point!) tried to argue that she did this work strictly for the purpose of furthering her own education. This was despite the fact that she repeatedly testified that she needed to do this work to support herself financially. I can’t imagine how frustrating it is to say the same thing over and over, and for the lawyers to refuse to hear your answer. No matter how long Penn tries to stall, we are confident in our ability to win an election because we have a positive vision for Penn. This vision includes making sure that everyone at Penn gets health, dental, and vision care, support for themselves and family members, and a contract laying out the rights and obligations of graduate student workers and the University of Pennsylvania. 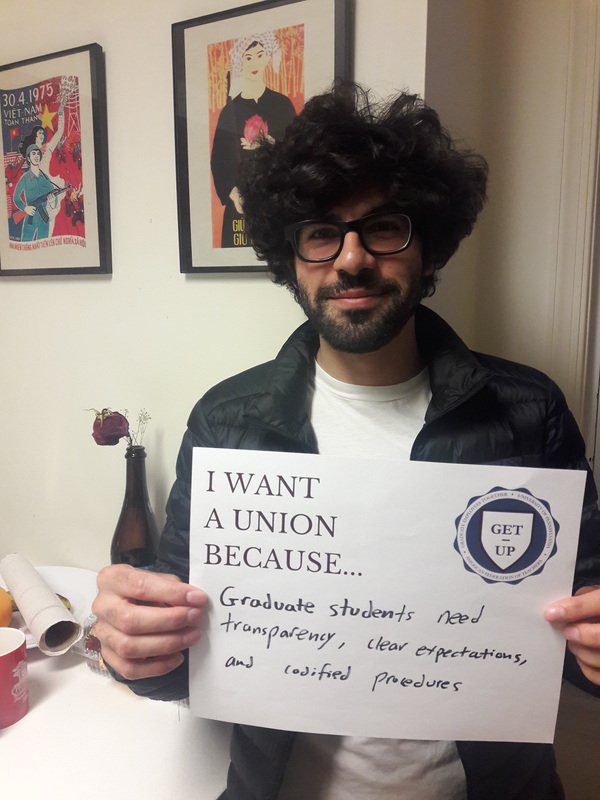 If you support the vision of a Penn where grads have a real voice in our work lives, please join us in signing the public pledge to vote YES for GET-UP in the upcoming election. If you are worried about being public in your support, consider that I was one of the 14 original signers of our constitution, have been working on this campaign for more than a year, have expressed my support publicly in the DP, and I have still managed to get permission to write my dissertation and secure a post-doctoral position for after I graduate. I believe in democracy in the workplace, and I think publicly standing up for that belief is an important step towards achieving it. NLRB Hearing Update: Day 10 – GET-UP Takes the Stand! Today, it was our turn. After two weeks of listening to administrators explain to us that we are not workers, that the work we do is only for our own benefit, and that we do not have the right to unionize, we were able to take the stand to set the record straight. Ballard Spahr came out swinging. Two partners threw everything they had against us. Before we could even call our witnesses, they vociferously demanded that all graduate students had to waive their FERPA rights in order to testify. In layman’s terms, they wanted us to waive the confidentiality restriction on our academic and financial records, which normally cannot be shared by the University. If we agreed, we’d have to surrender everything from our tax returns to our academic transcripts before we could even take the stand. But we fought back. Our lawyer argued that just because we are exercising our right to collective bargaining does not mean that we waive our other federally recognized rights. Sitting in the hearing room, listening to this back-and-forth, and struck by the exceedingly disrespectful tone of the Ballard Spahr partner arguing with our lawyer, it was very clear their primary goal in all this was to intimidate us. Trying to force us to relinquish our rights in order to testify is a thinly veiled attempt to intimidate us out of testifying at all. When that failed, Penn lawyers pushed for compromise, which allowed them to use some of our records. They went through Danielle’s transcript. They somehow dug up Salar’s CV, scrutinizing it line by line, hoping to trip us up. They tried to put words in our mouths, hoping to rework our explanations of teaching as mere “career development” instead of work. But Danielle, who testified first, pushed back. Carefully cataloguing her extensive work experiences at Penn, she once again showed that we are both students and workers. Stumped, the Ballard Spahr partners turned to obfuscation. When Salar, who testified next, asked for clarification, they responded with condescension: “The great thing about this hearing, Dr. Mohandesi, is that I get to ask the questions, not you.” At that point, the tension in the room, high all afternoon, reached a fever pitch. While revisiting Salar’s teaching record, including multiple award-winning semesters, the admin’s lawyer was visibly frustrated by his inability to make the witness bend to his will. When Salar refused to back down, stating again and again that the teaching requirements in the History department were convoluted, the admin’s lawyer, clearly agitated, shouted at Salar: it seems you have trouble understanding these things. We all stared at the lawyer, wide-eyed, incredulous that he deigned to disrespect a witness in such blatant terms. When everything had failed, Ballard Spahr returned to their usual tactic: stalling. All told, Danielle spent over two hours behind the witness stand, and Salar endured over three and half hours of questioning. But even amidst all the disrespect, intimidation, and stalling, we didn’t back down. We got to tell our story. We got to talk about what it’s like to work at Penn. We got our chance to have a voice in the future of our university. If you are frustrated by the stalling and the disrespect, if you are committed to supporting us as we defend ourselves against one of the largest law firms in the United States, if you want us to keep telling our stories, please join us in signing the public pledge to vote YES for GET-UP in the upcoming election. We are fighting to exercise our legal right to a union, but we’re also also fighting for the respect we know we all deserve. First we heard testimony from Kevin Turner (Mechanical Engineering & Applied Mechanics Associate Chair for Graduate Affairs); Stacey Lopez (Assistant Vice President for Institutional Research and Analysis); and Ufuoma Pela (Associate Director for Human Resources). In many ways, these witnesses reiterated a lot of the main themes we’ve heard over and over again during these hearings, centering on debates over our status as students and workers. Most notably, Stacey Lopez testified that her office reports enrollment data on grads and undergrads. She stressed how complex the system is, and how compiling a list of grads enrolled at any given time is complicated… but she also stated that payroll records are not part of her job. Penn seems to be angling to delay our election because the list of eligible voters is “too hard” to make quickly. This just seems like a weak argument, and another stall tactic. As I left work to bike to the hearing, I was excited to be in the room for the first time and see what it’s like. Since the beginning of the hearings, I haven’t been able to make it over to 615 Chestnut St., the regional NLRB office, but every day I’ve been following along on Twitter and reading the daily email update. Despite the many, many hours of hearings so far (*rolls eyes at Penn*) there’s always been a GET-UP member in the room to make sure everyone stays informed about what’s going on. This wouldn’t be possible with just a few people, because our time and labor is valuable–we all have stuff to do! But many people contributing a little bit to our union makes the whole thing work. As I noted online earlier, Twitter is a superficial example, but it really speaks to our organization’s vision of standing up for one another. Please take a moment to show your support of this vision by signing our Vote Yes pledge. Tomorrow, Penn grads will be testifying for GET-UP. It will mean a lot to have as much support as possible, so if you have been considering whether to make the trip to the hearing, tomorrow would be a great day to be there! It starts at 10am, but you can come at any time through the day. Also, join us all in front of College Hall at 1 p.m on Thursday June 29 for a picnic to hopefully celebrate the end of these hearings. Today was the 8th day of our hearings and I wasn’t there. Instead, for most of the day, I was at work at Penn as a “Temporary Extra Person” — otherwise known as a Fellow at the Center for Undergraduate Research and Fellowships. Before and after though, I checked out the day’s happenings on Twitter (#UPennHearing, @GETUPgrads) and spoke with a few friends and colleagues who were able to attend. After enduring seven days of the admin’s lawyers summoning provosts, deans and professors to question whether we are even workers at all, our lawyers attempted to call an expert witness, Dr. Adrienne Eaton, to the stand. Despite being the author of one of the major empirical studies that investigates the effects of graduate student unionization and an expert on grad/faculty relations, the admin’s lawyers argued that her testimony was irrelevant to our hearing. A hard position to understand especially given President Amy Gutmann’s own scholarship on “deliberative democracy”. Prior to resuming things after lunch, some of Penn’s employees (professors, deans, admins etc.) were overheard lamenting the pending Senate legislation that would dismantle the Affordable Care Act. Wonder if they thought about the fact that I am currently shopping for a plan because my coverage through my fellowship ends on July 31. Wonder if they thought about the savings I burned on premiums when I was granted medical leave but without health insurance during the Fall of 2014. Wonder if they thought about others in much rougher health situations. Next up on the stand was GSE’s Associate Dean for Academic Affairs, Matt Hartley. The author of numerous publications promoting “civic engagement”, “diverse democracy” and “public good”, the tension was strong between his intellectual interest and the cause his words on the stand are serving. Dr. Hartley, for instance, suggested that all GSE students are funded for four years of work and study, despite the fact that this blatantly ignores the school’s full-time EdD students who are offered only two years of funding — without health insurance. Next, he stated that PhDs at GSE are never self-funded. Not sure how to square that with the two academic year fellowships that I won and which provided tuition money that I don’t normally pay to the school. Not sure how to square that with being on medical leave without pay or insurance. And not sure how to square that with my hourly wage and time sheets now that I’m finalizing my dissertation with no fellowship funding. Of course, during the best of times, we are funded, but even then–and as the admission letters, funding letters and handbooks put on the record confirmed–we are workers! Like other grads across Penn, we are instructors of record, research assistants, and we have time sheets, all while also being graduate students. We’re not complaining — we love our work. We just want a seat at the table along with all of our fellow colleagues as we work to further Penn’s mission and make it a better place everyday. To help us do that, I hope you’ll take a moment to sign our pledge to vote yes in our upcoming union election. Also, join us all in front of College Hall at 1 p.m on Thursday June 29 for a picnic that will hopefully celebrate the end of these hearings. Zach here updating you on day 7 of union hearings. I’m a PhD student worker in political science, where I work on comparative politics and political theory. You might think that makes me prepared to tackle existential questions, but I am flummoxed when it comes to the university’s inability to acknowledge that I exist. Penn’s lawyers and our union’s lawyers are trying to come to an understanding of what a “student worker” is. But Penn prefaced their comments by saying “to the extent any exist.” This is what the hearings are about—not interdisciplinary professors, career counseling, communication skills, or laboratory experiments. Penn still hasn’t decided whether we exist. Well, the NLRB already has held that graduate students are both students and workers: we exist, and we’re prepared to keep coming back to the hearings, day after day, reminding Penn that we exist and we’re going to fight for a democratic say in our working conditions. The substance of today’s hearings was on the research process and, again, what graduate work really constitutes. The employer’s first witness was the Dean of SAS, Steven Fluharty, who argued that the mission of the university is the advancement of knowledge. Dr. Fluharty walked us through the process of getting an NIH grant, from the proposal to the letter of approval to a published work. The crux of the lawyers’ argument seemed to be that since our work as research assistants advances knowledge and contributes to our dissertations, it isn’t actually work. By that logic, no academic work is work. However, the employer’s first witness in the afternoon, Dr. Christopher Murray, a professor of chemistry and material science, argued that the mission of the university is not the advancement of knowledge, but rather educational development. However, this development involves “working in the lab, working on real problems.” Just because student development is part of Penn’s mission doesn’t mean what we do isn’t work, a subject on which Murray was refreshingly clear. Countless times, he referred to graduate students who “work” for him and to the “big job” of TAing a freshman chemistry class with “needy” undergraduate students. At the same time, Murray called his graduate students “a family,” to which we ask: do families pay for healthcare when their members are injured? If so, why don’t his grads get workers’ compensation? Penn’s other two witnesses took less time. Their final witness, Patricia Rose, director of career services, argued, just like Dean Fluharty, that the production of knowledge through publications was critical, not just for student development but also for getting jobs. The second witness from the morning, Kim Hoftiezer, Director of HR for the libraries, ended on an uplifting note when she revealed that full-time library workers are unionized, represented by AFSCME Local 590. Here’s hoping that we’ll join them as unionized workers soon! To help get us there, I hope you’ll take a moment to sign our pledge to vote yes in our upcoming union election.